↑ ক খ "Contact Info ওয়েব্যাক মেশিনে আর্কাইভকৃত ২০ অক্টোবর ২০১২ তারিখে." Air Arabia. Retrieved on 21 June 2010. "Air Arabia (UAE) Air Arabia Head Quarters Sharjah Freight Center (Cargo), near Sharjah International Airport P.O. Box 132 Sharjah, United Arab Emirates"
↑ Sobie, Brendan. "Low cost & regionals: Arabian pioneers." Flight International. 23 April 2007. Retrieved on 8 February 2011. "Air Arabia's headquarters is hidden in a dated cargo terminal at Sharjah airport, a 15km (9 miles) drive from central Dubai, which should take 15 minutes but can take up to two hours during rush hour." ↑ "Airports and ATC: nothing but the best", Flight International, 30 July 1977, p.354 (online archive version). Retrieved 3 September 2010. 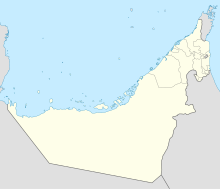 ↑ History of Sharjah. Retrieved 3 September 2010. ↑ Sharjah – How to Get There. Retrieved 3 September 2010.